Former GoDaddy exec places third in Republican primary. 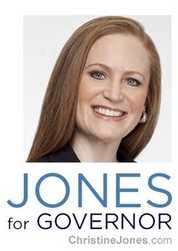 Christine Jones, former general counsel for GoDaddy, lost her bid to become the next governor of Arizona in the Republican primary yesterday. Doug Ducey, current Arizona treasurer and former CEO of ice cream franchise Cold Stone Creamery, took 37% of the vote in the primary. Jones finished third with 16.7% of the vote. GoDaddy founder Bob Parsons contributed over $1 million to fund attack ads against Ducey. Parsons told reporters his commercials were in response to Ducey claiming Jones was a “line employee” at GoDaddy; as general counsel she was one of the company’s top executives. Running in a Republican primary in Arizona, Jones and the other candidates leaned pretty far to the right to attract voters. Unsurprisingly, one attack against Jones was her cameo in a risque GoDaddy Super Bowl commercial. Jones’ 16.7% take in a crowded field was probably a lot better than people expected when she threw her hat in the ring. Her newly found name recognition should help her in business, or should she decide to run for another office. Mixing metaphors here: A “dry run” to “get your feet wet” for the next bid. Better luck next time. Interesting little game of “inside baseball” there as it relates to the Parsons donations.